http://www.JewishWorldReview.com | For many families, this is March madness  the moment of high anxiety concerning higher education as many colleges announce their admittance decisions. It is the culmination of a protracted mating dance between selective institutions and anxious students. 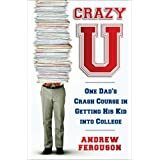 Part agony, part situation comedy, it has provoked Andrew Ferguson to write a laugh-until-your-ribs-squeak book  "Crazy U: One Dad's Crash Course in Getting His Kid into College." "There are 36,000 high schools in this country. That means there are at least 36,000 valedictorians. They can't all go to Brown. You could take the 'deny pile' of applications and make two more classes that were every bit as solid as the class that gets in." Your son's gazillion extracurricular activities? Kat sniffs: "He's a serial joiner .?.?. just running up the score." He was "invited" to participate in a "leadership" program in Washington? Kat's lip curls: "The invitation came in the mail, I guess. It said he was 'selected.' Do you know why he was selected? Your ZIP code. They knew you could pay." Ferguson becomes one of the Kitchen People  parents who at parties cluster in kitchens where "in the reflected shimmer from the brushed-steel doors of the Sub-Zero, the subtle dance would begin." Squirming against the Viking oven, a mother is bursting  or wanting to burst  with pride over her child's SAT scores. "Her eyes plead, Ask me what they were, just please please ask .?.?. "'Her father was like, Oh, My, G0d.' And from the eyes, silently: Ask. "'Of course, she tests well in general. But scores like these . .?.?.' Her pride bladder was terribly distended now, swelling in all directions, this painful unsatisfied need driving her nearly to the slate flooring. "And then she'd sip the Zin with a humble smile." Click HERE to purchase it at a 38% discount. (Sales help fund JWR.). "He's a 17-year-old boy! I wanted to tell her: Seventeen-year-old boys do not have innermost thoughts  and if they did, neither you nor I would want to know what they are." It is, he says, nice to know there is $143 billion for student aid  but worrisome that $143 billion is needed. His history of the SAT confirms the assessment that it is "impossible to find a measure of academic achievement that is unrelated to family income." It has been well-observed that America's least diverse classes are SAT prep classes. Still, the college admission process occasions too much angst. America is thickly planted with 1,400 four-year institutions. Motivated, selective students can get a fine education at any of them  unmotivated, undiscerning students at none. Most students love the schools they attend. And the admissions quest can have splendid moments. Last year, Wake Forest, a wonderful university with a stimulating application form, asked applicants what they would title their autobiographies. One, obviously a golfer, answered: "Mulligan." Wouldn't we all?